All India Rainfall from 1st. June to 20th. July. Today's rain accumalation shows good rains in Punjab and H.P. 103 mms during the day in Simla and 76 mms in Amritsar. And rain along the western off shore trough. See any signs of a low in the bay off A.P.?? Rainfall increase, upto 75 mms/day, in Mumbai from Wednesday thru Friday due to stronger off shore winds and possibility of low in bay. 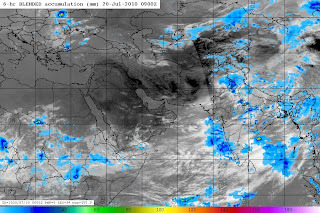 A low pressure area is likely to form over northwest Bay of Bengal and neighbourhood around 24th July 2010.
anant, low pressure has formed and moved in as i said in my blog. I think another is due in a few days.